Whether you’re struggling with serious tooth pain that just won’t go away or your child has somehow managed to knock out a permanent tooth while hanging out on the playground, Premier Family Dental is here to provide assistance and much-needed relief to patients in need. Please contact us right away here in Central Texas for fast emergency care so that Dr. Cofer can make time to see you as soon as possible. Here are some helpful tips that families should follow when faced with some of the most common injuries that our team sees. Remember, contacting us should always be high on the list! 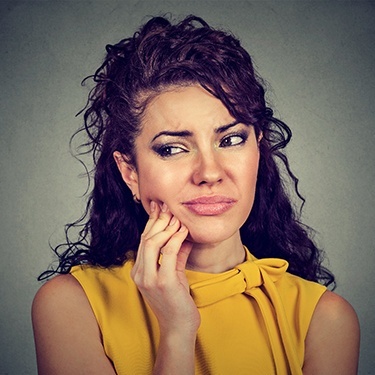 If you’re hoping to have the tooth successfully re-seated in your smile, your first priority should be to keep it as moist as possible. If you’re able to, place the tooth back into its original socket (without touching the root) and gently hold it in place with your tongue. If this isn’t possible, holding the tooth in the mouth between the cheek and gums OR placing it in a cup of milk can also work, as long as you make plans to see us right away. First, start by thoroughly rinsing your mouth with lukewarm water and then flossing. This should dislodge any food particles or foreign substances that could be causing the discomfort. If pain continues, you need professional help. In the meantime, it is okay to take a painkiller, but do not place it directly on the tooth or the gum tissue. Rinse your mouth with lukewarm water in order to get rid of the blood. Hold a cold compress to the appropriate cheek in order to keep any facial swelling to a minimum. Is there a possibility that your jaw is broken? Are you experiencing heavy, sustained bleeding? These are dire situations that need the support of a full emergency room staff. Go straight to the nearest one in the area and then contact our practice after you’ve recovered so we can provide any needed restorative and cosmetic procedures. Schedule a checkup and cleaning for the whole family every six months! By visiting a trusted and experienced dentist like Dr. Cofer at regular intervals, you can ensure that any dental problems are caught and treated at their earliest, most harmless stages. Do you play any sports where physical contact with other players or hard objects is a possibility? Make sure to wear a mouthguard so your smile is well-protected during the big game. If you suspect that you suffer from bruxism (teeth grinding), talk to Dr. Cofer right away about having a custom-made nightguard created. Be very careful when enjoying foods that are sticky, tough, or hard to chew. Stick to a diet that has plenty of good vegetables and fruit! Also, don’t chew on the ice that comes in your drink, as you run the risk of cracking your enamel. Use scissors to open packaging and not your teeth.